"The Big Blue" is... big. It has grown to a collection of 117 patches, divided in 4 categories, of truly unique sounds for Serum. Perhaps the biggest collection entirely dedicated to evolving pads and textural sounds for this synth (AFAIK), made to give musicians an instant inspiration. What really means to you subtle, cinematic, narrative, ever-evolving, deep, wide fields, playable noises, (and more) for your music? 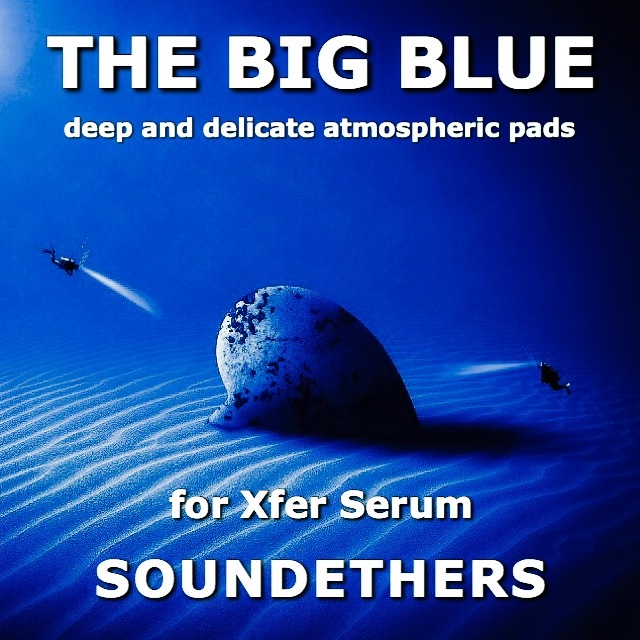 "The Big Blue" is the soundset that you might have been missing. It's an instant atmospheres builder collection, made for film and game composers, IDM, Ambient, Chillout producers, and really a lot more, based on original field recordings and evolving textures and pads.PleaseTWEAK IT, use Macros and Mod Wheel, explore it, (try to disable wavetables, or the noise section, and see what happens...) to understand the great potential at your fingertips, to create a lot more atmospheres than the presets only are showing. This is a big collection of a nearly unexplored sonic field for this dream-come-true plugin. - Lots of custom wavetables you can edit, save and use.